Anna Hatton is a Lecturer in Physiotherapy and Postdoctoral Early-Career Researcher within the School of Health and Rehabilitation Sciences. Originally from the UK, Anna was awarded both her BSc(Hons) in Physiotherapy and PhD in Rehabilitation Sciences from Teesside University, (Middlesbrough, UK). Anna’s main research interests include balance control, gait analysis, ageing populations, footwear interventions, sensorimotor function, musculoskeletal conditions, neurological disorders, and falls prevention. 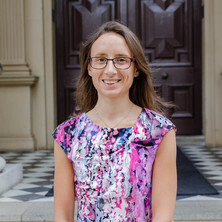 To date, Anna’s work has been supported through funding from major bodies including the British Geriatrics Society, Multiple Sclerosis Research Australia, and National Health and Medical Research Council. Having worked as a Research Fellow at the University of Salford (Manchester, UK), Anna arrived in Australia in 2010 to undertake a prestigious Australian Endeavour Postdoctoral Research Fellowship and Baroness Robson Travel Scholarship at Neuroscience Research Australia, Sydney, NSW. Thereafter, Anna moved to Brisbane to take up a position as a Joint Research Fellow in Physiotherapy between the Princess Alexandra Hospital and The University of Queensland. She commenced her current teaching and research appointment in early 2014. This series of studies investigates how lower limb musculoskeletal conditions, including patellofemoral pain, anterior cruciate ligament injury, hip chondropathy, and early-onset hip osteoarthritis, can affect static and dynamic balance performance. We are also exploring whether physiological measurements, such as hip and trunk muscle strength, joint range of motion, foot mobility, and patient-reported outcomes are related to balance control in these clinical populations. Balance problems in older people can be made worse by the presence of disease, such as joints wearing out. We know older people have particular difficulty reacting to a sudden loss of balance in a sideways direction. However, what we don't clearly understand is how common diseases affecting the hips and trunk impair sideways balance. This study will look at how hip osteoarthritis affects people's ability to respond to a sudden loss of balance in a sideways direction by exploring how the different body segments move and how the leg and trunk muscles work to keep individuals standing upright. The benefit for people affected by hip osteoarthritis is that this study will lead to the development of new, effective treatment techniques that can help them to balance better and to maintain their independence for a longer time. Hatton, Anna Lucy and Rome, Keith (2013). Postural stability measurement: implications for footwear interventions. In Ravindra S. Goonetilleke (Ed. ), The science of footwear (pp. 513-534) Boca Raton, FL, United States: CRC Press. Hatton, A. L. and Rome, K. (2012). Feet. In Margot Gosney, Adam Harper and Simon Conroy (Ed. ), Oxford Desk Reference Geriatric Medicine (pp. 244-245) Oxford, United Kingdom: Oxford University Press. Hatton, Anna L., Sturnieks, Daina L., Lord, Stephen R., Lo, Joanne C. M., Menz, Hylton B. and Menant, Jasmine C. (2013) Effects of non-slip socks on gait patterns of older people when walking over a slippery surface. Journal of the American Podiatric Medical Association, 103 6: 471-479. Dixon, J., Gamesby, H., Robinson, J., Hodgson, D., Hatton, A.L., Warnett, R., Rome, K. and Martin, D. (2011). Immediate effects of textured insoles on postural stability in people with Multiple Sclerosis. In: Abstracts from the World Confederation for Physical Therapy 16th International Congress. World Confederation for Physical Therapy 16th International Congress, Amsterdam, Netherlands, (eS292-eS293). 20 - 23 June 2011. Do Textured Surfaces Affect Postural Stability And Lower Limb Muscle Activity In Young Asymptomatic Adults?